..Wee Memories..: What a Monday! Time change thru me for a loop, I was yawning all day and hardly could keep my eyes open. Thank goodness for naps! I needed it! :) Hope your getting thru it (if you had to change time). Plus it didnt help that it was Monday too, ick! Anywhoo... I made a couple of cards tonight. Not for challenges or anything just having fun using my stamp sets, I wanted to do some tonight that didnt involve having to make it a certain way. And I love the Quotes on them, they are from my Unity Stamp Quote bundle. PS: Dont forget to spread the word about my blog candy giveaway, see the post HERE. I have added more Martha Stewart goodies and some stamps! 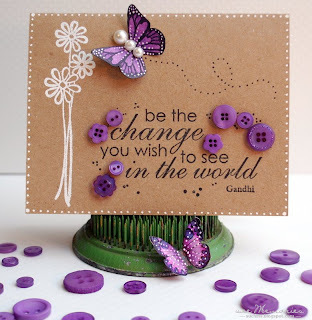 These are just gorgeous love the butterfly stamp!!! Jenny, these are fabulous! I love butterflies too. I went to Yosemite many years ago and someday would love to go back, there's no place like God's creations, that's for sure! Happy Tuesday! Stunning cards Jenny! Love those butterflies. The layouts are great too! oh my.. these are fabulous.. LOVE THEM! wow... gf.. stunning creations! 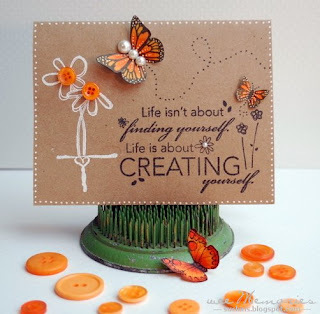 Oooh, these are FABulous kraft cards Jenny! Love the details and you made those butterflies look so pretty! TFS!